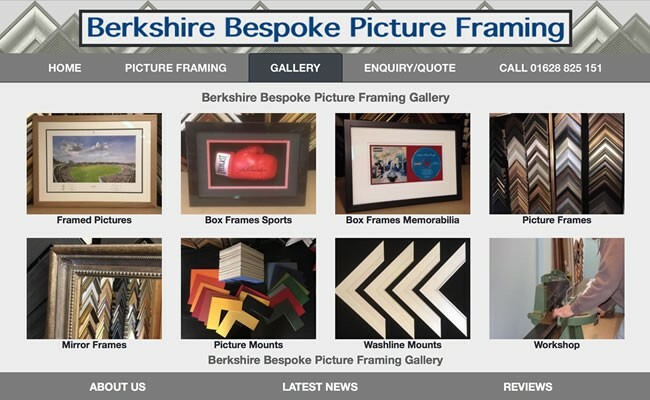 Berkshire Bespoke Picture Framing in Maidenhead by Alan Butfoy offering a Bespoke Picture Framing service covering all aspects of framing from posters, certificates, photographs, prints, watercolours, oils, tapestries, needlework and football and rugby shirts. All of our framing is done to a high specification using conservation methods, acid free mounting and backing and uv glass for protection of your artwork. Some recent WebAlert web designs are shown above ~ simply click an image to view the site.